By Vanessa Van Petten, creator of RadicalParenting.com, a parenting website written from the teen perspective to help parents understand them. I believe technology provides some really fun activities for techie kids and parents, grandparents or even teachers to bond. 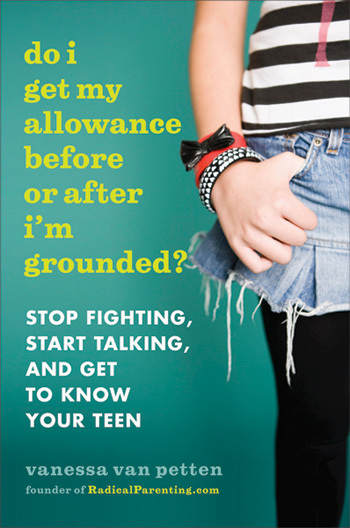 In my book Do I Get My Allowance Before or After I’m Grounded? I talk about all the ways that technology can be positive and how parents can use this to their advantage. Geo-caching is a really fun way to integrate online and offline activities because you use technology to do a real world scavenger hunt. Geocaching is an outdoor activity in which the participants use a Global Positioning System receiver (GPS)—like one in a car or on your smart phone to hide and seek containers, called “geocaches” or “caches”. A typical cache is a small waterproof container containing a logbook where each finder puts their name and a fun fact for the next person. Have your techie kid show you how to use a GPS system from a car or on the phone to scavenger hunt. Wikipedia explains the history of geo-caching. Love Eragon? Harry Potter? Twilight anyone? Have them start a discussion forum with other kids or start an online book group together. Young athletes? Chess? You can start their own network on Wetpaint.com and keep it private just to their friends or open it up. Interview grandparents and family members and record an oral history of the family. You can think of questions with your child and build a story—like a plot for your family’s history. Do a sports podcast once per month or a funny show that you put on together and put on iTunes. Make a video of your family’s favorite spots and restaurants around your hometown. When guests come into town you can send them the video tour.